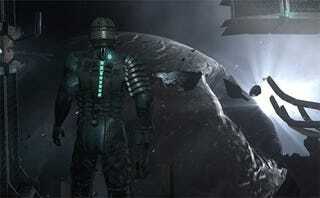 Visceral Games' Dead Space 2 may not be the next game you play in the sci-fi franchise. Recent surveys point to an Xbox Live Arcade and PlayStation Network port of Wii misfire Dead Space Extraction and something brand new, Planet Cracker. One survey's description of the Xbox 360 and PlayStation 3 port of Dead Space Extraction indicates that any planned port of the game would feature the same on-rails "guided first-person experience" gameplay, pitched as an "interactive horror experience" in "full HD." A tentative price of $15 USD was mentioned in the survey forwarded to Kotaku. Another title, known as Planet Cracker, was potentially more interesting. Described as a "resource strategy game where players will manage a CEC Mining operation," Planet Cracker focuses players on attempting to "maximize their daily profit" and "defending their hard-won ore from Space Pirates." Sounds like Ore Tycoon aboard the USG Ishimura. Planet Cracker was billed in the survey as an extension to the story of Dead Space 2 and could yield "in-game rewards" for the retail version of the sequel, similar to the Fable II Pub Games that preceded Lionhead's role-playing game and netted players in-game gold. Both Dead Space Extraction HD and Planet Cracker were listed a possible incentives for Dead Space 2 that could be unlocked to those who pre-purchased the game. While the survey appears legitimate, EA's plans may change, so we're labeling this information as rumor until any official announcements are made. We've contacted Electronic Arts to get clarification but have not yet heard back. Update: EA responded with one word: "Rumor."